That's not a catalog error; the stellar remnant in the center of every planetary nebula and supernova remnant at present is procedurally generated. How does that prove that? First of all, if the star actually went supernova almost 1 billion years ago, the nebula surrounding it would have long since vanished. Second, just a few pages ago, you said that the age of a white dwarf includes everything from the time since the original star formed to this very day. Why wouldnt the same rule apply to neutron stars and black holes, since they are stellar remnants as well? If the star actually lived that long to begin with, it wouldn't be massive enough to go supernova. So it proves nothing other than an unrealistic timespan being generated. Because a white dwarf isn't actually formed when its original star dies, it is merely exposed (it is after all just the core of the original star). But a neutron star or a black hole is actually formed by the supernova that destroyed its progenitor. So there is a fundamental difference in how and when these objects are formed relative to their progenitors. Maybe we should just let SpaceEngineer tell us which of the two systems is actually used. The age of star is age of its progenitor. So it was a bug. This moon has this fluttering glitch when you go to it. Click the image to see it in a gif. Just looks like the eclipse bug to me. Look to see if there are binary suns or if there's a giant planet between this planet and the sun. Star flares sometimes disappear with no apparent reason. I think they're still there, but the auto exposure fonction made them invisible. You will notice that when suns rise for the second time, they are without flare. I'm not 100% sure, but I think this 'bug' is occurring only when taking a video (F9). That is not a bug, but an error in the HIPPARCOS star catalog entry. SE calculates stellar parameters from the data provided, so if that data is wrong then the resulting star will not make sense. My guess is that the parallax is wrong -- HIPPARCOS catalog gives it as 0.22mas, which is way too far away. So in order to have the correct apparent magnitude, SE makes the star more luminous (note the absurd absolute magnitude / luminosity), which means for a given surface temperature the radius has to be huge. 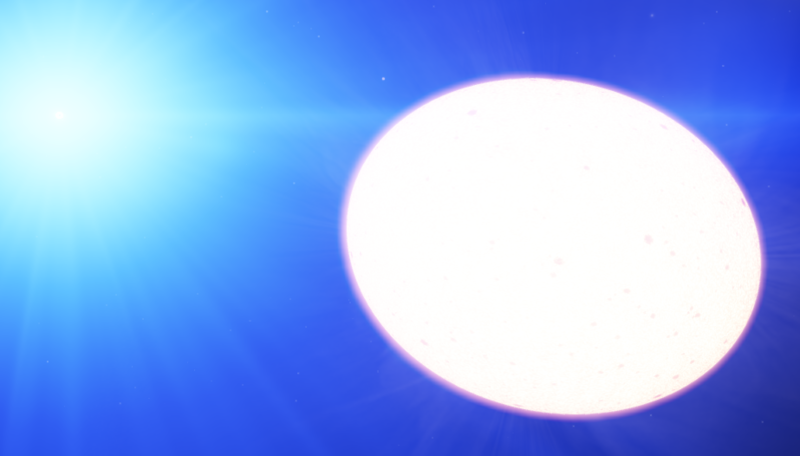 Alternatively, the star could really be a giant and the spectral type is wrong. RockoRocks, read the very first item in the known issues list. There was no reason to post this. Is it just me or does Antares look a little far away from its respective nebulae? Voekoevaka made the nebula model and catalog entry. Talk to him about it.